This book, the first of a planned trilogy, was published by Cambridge University Press. Unfortunately too often elections around the globe are deeply flawed or even fail. Opponents are banned. Campaigns are awash with money. Reporters are muzzled. Registers are outdated. Parties boycott contests. Officials are partisan. Ballots are fraudulent. Elections spark violence. Courts fail to resolve disputes. It is widely suspected that flawed, or even failed, contests will undermine confidence in elected authorities, damage voting turnout, trigger protests, exacerbate conflict, and occasionally lead to revolutionary regime change. Well-run elections, by themselves are insufficient for successful transitions to democracy. But flawed, or even failed, contests are thought to wreck fragile progress. But is there good evidence for these claims? Under what circumstances do failed elections undermine legitimacy? With a global perspective, using new sources of worldwide data for mass and elite evidence, this book provides fresh insights into these major issues at the heart of the study of elections and voting behavior, comparative politics, democracy and democratization, political culture, democratic governance, public policymaking, development, international relations and conflict studies, and processes of regime change. "The book is theoretically sophisticated and provides a brilliant comparative account of the relationship between electoral integrity and democracy around the world. The book will be immensely useful to students and scholars of political science and comparative political sociology." Book review by Sarbeswar Sahoo in Democratization 22(6): 1158-1159 (June 2015). The volume is the first in a trilogy by the author on Challenges of Electoral Integrity published by Cambridge University Press. 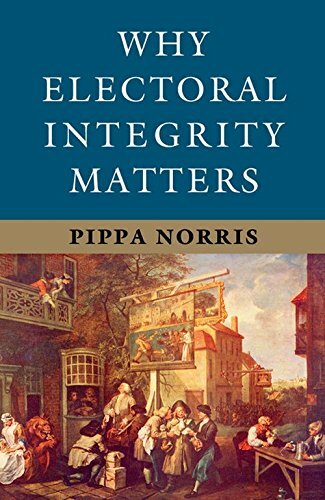 This series of books explores many issues concerning electoral integrity, with successive volumes focusing upon three main questions: What happens when elections violate international standards of electoral integrity? Why do elections fail? And what can be done to mitigate these problems? To address these questions, the study draws upon the Electoral Integrity Project, a multilevel research project generating new evidence about the quality of elections worldwide.